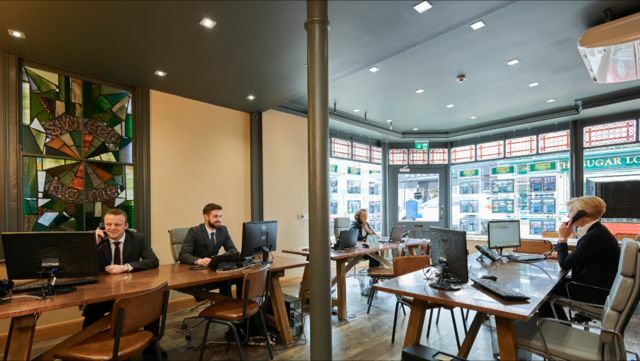 This estate agents has created a contemporary office decor with the help of our industrial inspired furniture. 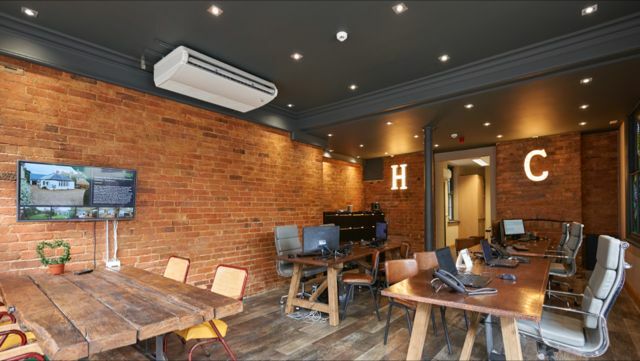 With exposed brick walls and wood-panelled floors, this office space was a great canvas to build on. We love how our ‘Malaga’ tables have been used as desks; the tables combine rustic pine bases and modern copper tops, giving the space a really contemporary twist. Our tan ‘Chelmsford’ chairs complement the copper tables beautifully and provide a comfy place for customers to sit. The company has paired a chunky vintage table with our fantastic, repurposed cinema chairs, adding a pop of colour to this otherwise coordinated room. At the back of the office, light-up letters display the company initials – a great finishing touch!